2/12/2011 – After the success of the first study solving competition held at Wijk aan Zee two years ago (unexpectedly won by Dutch player Twan Burg, with John Nunn second), the event was repeated this year. It was won by one of the oldest participants, none other than the world-class problem solver (and ChessBase photographer) John Nunn. Here's a pictorial report and a sample study to solve. The event was organised by Yochanan Afek in conjunction with ARVES (a Dutch-Flemish organisation for endgame studies). It took place during the Tata Steel Super-GM tournament in Wijk aan Zee in January. of 76,000 endgame studies, and is also a keen photographer. Nunn, a three-time winner of the grandmaster A tournament in Wijk aan Zee, scored 36 out of the maximum of 45 points to closely finish ahead of the top Belgian solver GM Eddy van Beers 34. The big surprise of the event was the third place finish of WGM Alina L'ami (member of the Romanian Olympic women team and the wife of Dutch GM Erwin l'Ami) who scored 33 points in her first solving tourney ever! She was followed by Dutch IM Piet Peelen, ahead of Marcel van Herck 31.5, Martin van Essen 29.5, GM Piotr Murdzia 27.5 (the world's highest rated solver) , IM Twan Burg (winner of the first edition) 27, and GM Dolf Wissmann (the Dutch champion) 26.5. The best junior prize was won by Peter Ypma who ended in 10th place with 26 points. Here’s one of the simplest studies for you to solve yourself. The solution will appear here, below the diagram, in the course of the coming week. Solution to the problem by Yochanan Afek: 1.a7 Rb4+ 2.Kxa5 Rb5+ 3.Ka6 Rb1 4.Nxc6 Kxc6 5.b8N+ Kc7 6.Nc6 Ra1+ [6...Rb6+ 7.Ka5 Rb1 8.Ka6] 7.Na5 Rxa5+ 8.Kxa5 Kb7 9.Kb5 draw. The picture (click to enlarge) is of the galaxy M101 in Ursa Major, often called the Pinwheel Galaxy. It's about 25 million light years away and is approximately twice the size of our own Milky Way galaxy. Spiral galaxies vary greatly in appearance according to the angle at which we are viewing them. 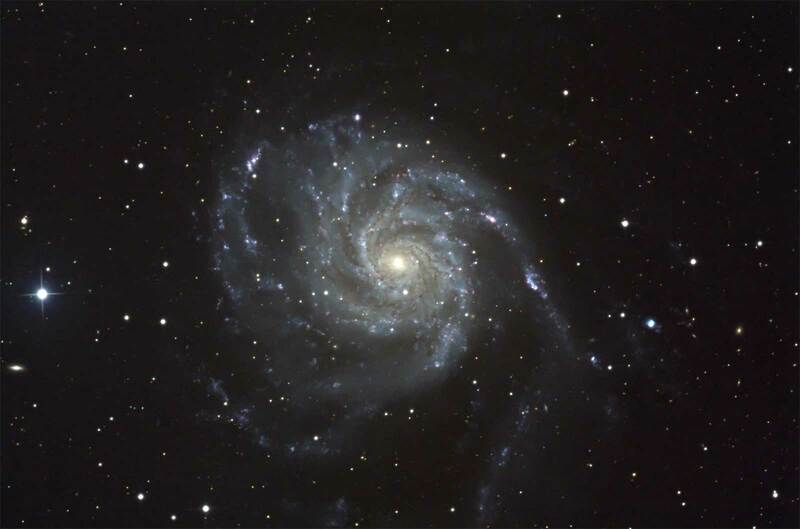 M101 appears almost face-on, which gives us the chance to appreciate its spiral arms and the large number of star-forming regions, which appear bluish in colour. This picture was taken on remote telescopes provided by Global Rent a Scope, which I have been using with great pleasure for some time now. A description can be seen in my article Chess and Astronomy from June last year.